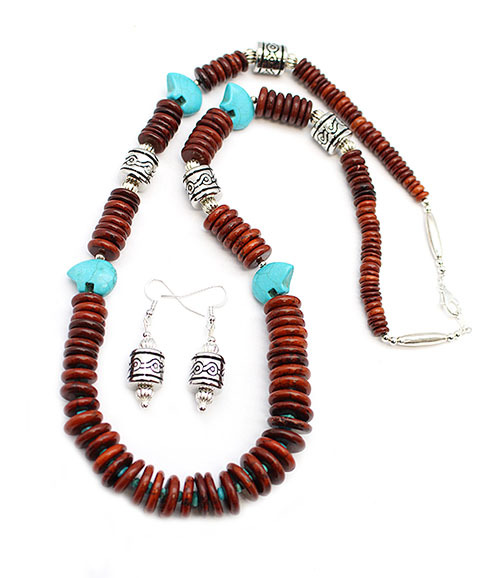 This necklace is strung with synthetic reddish brown magnasite disc's, silver plated beads and barrel beads and magnasite bears. It measures approximately 26" long including silver plated findings by just under 3/4" wide on bears. Earrings meausre approximately 2" long including silver plated french wires and beads by 1/2" wide barrel bead. It is Navajo hand crafted by Sandra Francisco. Only this one available.